First published in The Paris Review, Goodbye, Columbus (1959) is the novella that shot Philip Roth into the limelight of the literary world. It is the story of a summer romance between a young Jewish boy of lower-middle-class background and the daughter of a wealthy family who have recently arrived at the upper end of the middle-class spectrum. Neil Klugman works in Newark Public Library and lives with his Aunt Gladys. One day at the swimming baths he meets – in as much as he willingly holds her glasses for a few moments while she dives from the high board – Brenda Patimkin and his “blood jumps”. With a directness that is a little startling, Neil arranges to take the object of his affection out having discovered her telephone number indirectly. These were the days before love was free but it was certainly not at a premium and the young couple strike up a relationship that suits them both for a summer. As with all seasonal romances, it must end, and between them the pair manage to extricate themselves from anything longer term using, if there was any doubt about the sexual politics of the story, a diaphragm as the object of their rift. As with all young people, Neil is in a struggle with the rest of the world to develop his own identity and carve out a unique place for himself. As a young liberal Jew making his way in the repressed and conservative America of the 1950s, it is obvious that Neil is at opposition with much of the society around him. Encouraged consistently to assimilate into the culture in which he finds himself, he struggles to understand Brenda and her family who wilfully shed – even undergo plastic surgery to hide – their Jewishness. Yet at the same time he is from a family built on the foundations of their faith and their Otherness as immigrants to America; as a librarian who has spent his whole life in America and holds a degree in philosophy, the traditional values of his Jewish community, then, feel equally alien to Neil. His Aunt Gladys reacts against his seeming wish to better himself and escape the life he has been brought into and which his family have lived with contentment for years. Aunt Gladys is the epitome of a character who lives life in a world that barely extends beyond her front door and struggles to see why anyone should wish to escape to something bigger. Her rule over the kitchen of the home is both hilarious and symbolic of her life views – she prepares a different meal for each of her family each evening, one after another. As she says, "Sure, I should serve four different meals at once?" And she won’t season her offerings with pepper as "she'd heard on Galen Drake that it was not absorbed by the body, and it was disturbing to Aunt Gladys to think that anything she served might pass through a gullet, stomach, and bowel just for the pleasure of the trip." But Neil is of a new generation, one who sets more store in the pleasure derived from life’s trip and this sets him at odds with Aunt Gladys and the inward-looking family tradition that she represents. Brenda may initially appear to offer Neil a way to break out of the narrowness of the view of life he has been raised on, but she proves to offer no real solution. She is the American Dream incarnate: her affluent family are the perfect consumers with all the modern conveniences foisted upon middle-class Americans in the 1950s rammed into their idyllic house on the Hills and she is a vivacious, educated young woman. It is a dream that isn’t for Neil, however, as he opts not to complete his assimilation into the middle-class idyll that once looked so tempting. Assimilation is important in the novella in a variety of ways. As it is Roth, Jewishness is unsurprisingly at the centre of the story and he uses irony to satirise an anxiety about assimilating that appears rife in his middle-class Jewish characters. 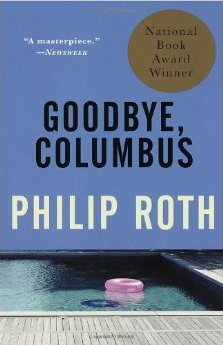 Through his ironic look at elements of Jewishness, Roth was accused of anti-Jewishness on the publication of Goodbye, Columbus. It is a charge that has been often repeated throughout his career and which seems to miss the nuance of what he is doing for the most part. Roth also draws parallels between the Jewish and other minority groups as he would continue to do in future novels. During his shifts in the library, Neil encounters a young African-American boy who comes almost daily to stare at paintings of Tahiti in a book of Gauguin’s work. Among the other members of staff in the library, Neil is aware of an unease at this boy’s presence, as though he is somehow incongruous in the house of learning. It is a very earlier example of Roth’s coupling of the Jewish and African-American experience of Otherness in America which would feature in his later work, most notably The Human Stain. But further than this, Neil identifies with the boy who stares on the rich paintings of Tahiti and dreams of a foreign world. Like him, Neil dreams of the foreign world of the Patimkins; of middle-class luxury. Yet his dream is equally as unrealistic as that of the boy who visits the library daily. When the Gauguin book is borrowed by another user, the symbolism of the boy left bereft by the loss of a dream that was never really within his possession is not lost on Neil. Sometimes dreams simply cannot be assimilated into reality. "Actually we did not have the feelings we said we had until we spoke them—at least, I didn't; to phrase them was to invent them and own them. We whipped our strangeness and newness into a froth that resembled love, and we dared not play too long with it, talk too much of it, or it would flatten and fizzle away." "It was, in fact, as though the hundred and eighty feet that the suburbs rose in altitude above Newark brought one closer to heaven, for the sun itself became bigger, lower, and rounder, and soon I was driving past long lawns which seemed to be twirling water on themselves, and past houses where no one sat on stoops, where lights were on but no windows open, for those inside, refusing to share the very texture of life with those of us outside, regulated with a dial the amounts of moisture that were allowed access to their skin." Everything in the story really flows from the disparate classes of its two main characters. The diaphragm is the decisive bone of contention in Neil and Brenda’s relationship, which allows them both to extricate themselves from a pairing that is doomed. Exploring fresh sexual territory, Neil soon asks Brenda to get fitted for the contraceptive device. When she is hesitant, he feels the powerlessness of his position with the girl who is from a socioeconomic class above him and who appears to have ultimate control of their relationship. Thus he pushes all the more until his demand is met. The diaphragm leads to the end of their relationship, however, when Brenda accidentally leaves it at her house where her parents discover it. Distraught that their daughter treats her chastity so lightly, Brenda is left with a choice and ultimately turns away from Neil and back into her family’s arms. Whether Brenda intentionally leaves the diaphragm to be found or whether Neil insists on its use to – subconsciously or not – sabotage the relationship is an interesting question, and who is trying to extricate themselves from the tryst is even more so. The story is laced with nostalgia, many of the characters looking back to memories past, never to be recaptured. The title of the novella is a reference to just this, ‘Goodbye, Columbus’ being the closing line of a song on an Ohio State yearbook record of Ron’s (Brenda’s brother) who, on the verge of marriage, looks back longingly to his College days. Leo Patimkin (Brenda’s uncle) also looks back to a night he spent with a woman while he was a soldier and both these minor characters emphasise the significance of time in the novel. It is not just the men who quietly ache for the past. Brenda claims her mother hates her and in the story there is little evidence to contradict this. In fact, it seems that Mrs Patimkin is jealous of her daughter’s youth and the privileged upbringing she is afforded. Even familial love, it seems, does not soften the jealousy towards those who have time and youth on their side. Neil views the world around him in this light himself, as a world that shifts constantly and irretrievably as time flows soundlessly by. Goodbye, Columbus is a surprisingly polished piece of fiction for a first published work. It is remarkable not only how Roth was able to write about significant issues within his sphere of interest with such clarity from an early age but how enduring these themes have been within his fiction, marking a particularly keen eye on his part for knowing himself and what was important to him from the society that surrounded him. Even his setting of Newark (a literary space that would later become synonymous with Roth) and his nuanced understanding of the geography of the place and how it signifies much about society is already in place. The story may not appear remarkable in outline but it leaves a fair amount to ponder and plenty to enjoy.